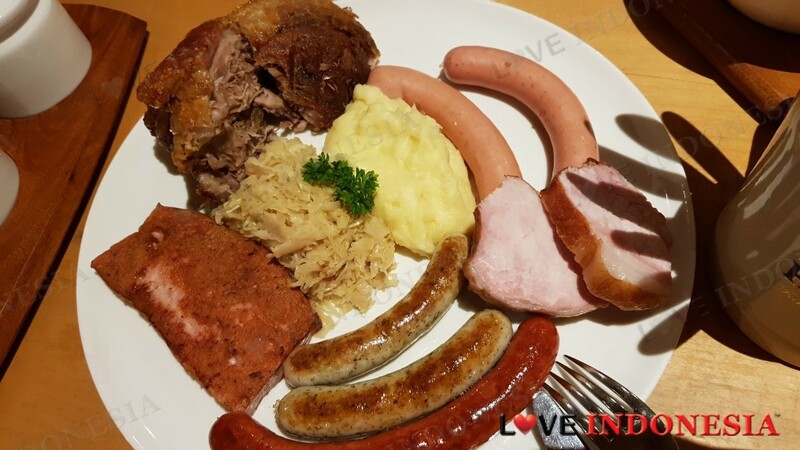 With an array of hearty Bavarian dishes on their menu, we recommend the Homemade Butchery specialities which includes smoked pork chop, boiled pork knuckle, pork sausage, meatloaf, sauerkraut and mashed potatoes. For a more modest portion we recommend the Bavarian Sausage Platter. There are also several non-pork dishes available as well such as the very tender goulash stew, half roasted chicken and spiced Camembert Spread. To end the hearty meal we suggest the obvious choice of apple strudel and the Grandma original Black Forest Cake A perfect place to hang out after a stressful day at work or if you are planning to hold a event. Pork knuckle in paulaner is amazing. 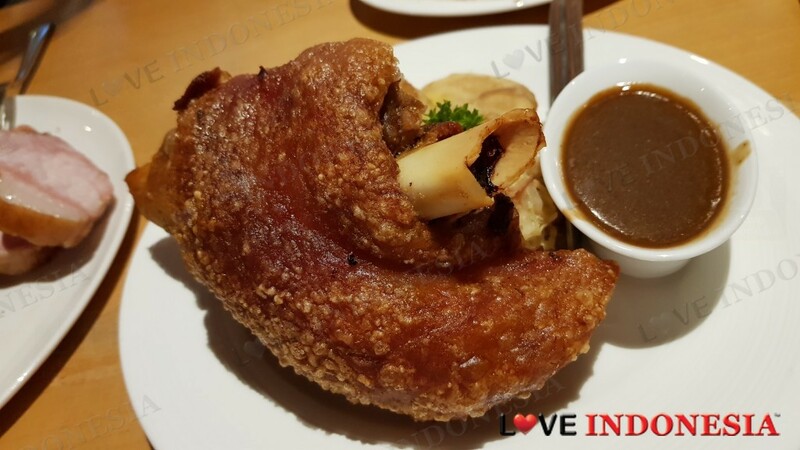 It is crispy and the scent of the pork knuckle is not un appetizing, it smells delicious and it is good food for resonable price. I don't really into beer, but i like paulaner beer very much! and light one is better for me..
the food is good, pork sausage is one of my fav. i like the live music performance..
the band always plays good songs (mostly songs I like ) not only songs that hit now but also old ones (and they accept song request). Some of the server need to be trained more. 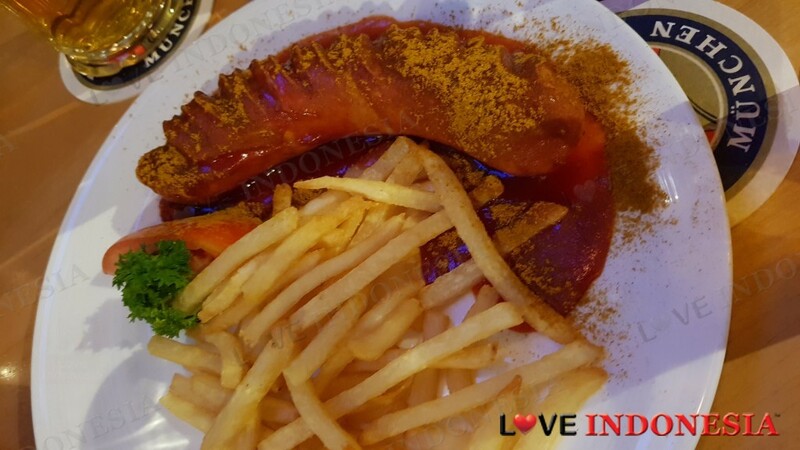 This restaurant can be considered as one of Authentic German Cuisine in Jakarta. With cozy and warm environment; lunch, dinner or even hanging around with friends after working hours. Fast service is also a plus to this restaurant. Talking about foods, good quality bavarian dishes are served at affordable price . You may like to take "Baked Potato with smoked salmon, sour cream and salad or selection of bavarian cold cuts & cured ham;as your starter, then you can also try its Hearty Goulash Soup then followed by its homeade butchery specialities " Bavarian Sausage Platter" which consist of Nuernberger, pork sausage & vienna sausage served with generous mashed potato and bavarian a must side dish " sauerkraut": If you feel you are not full enough; Bavarian Beef Goulash is worth to try; its tender and mild bavarian spices would satisfy your appetite. Don't miss a piece of Homemade Apple Strudell with crunchy pastry and honey sweet apple and vanilla sauce or grab a plate of Emperor Pancake with Apple Compote; those dessert will make your meals complete. If you are a beer drinker; a try to a glass of its lager beer is recommended. Paulaner Brahaus is well known as it best beer reputations in its hometown "Munich" which produce beer using a 375 years old recipe founded by the Monks of St. Paola in 1634. The beer only using 4 natural basic ingredient such as barley, hops, yeast and water so its resulted a bitter and fresh taste characteristic. With a price less than Rp. 50,000 you would enjoy a freshness where you will forget your daily routine while listening to the musics. "TM"
What is near "Paulaner Brauhaus"?